China today is visible everywhere - in the news, in the economic pressures battering America, in the workplace, and in every trip to the store. 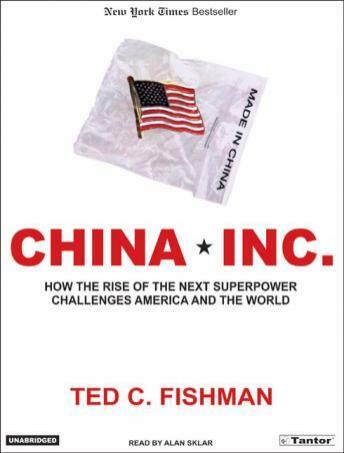 Provocative, timely, and essential, this dramatic account of china's growing dominance as an industrial super-power by journalist Ted C. Fishman explains how the profound shift in the global economic order has occurred - and why it already affects us all. How has an enormous country once hobbled by poverty and Communist ideology come to be the supercharged center of global capitalism? What does it mean that China now grows three times faster than the United States? That China uses 40 percent of the world's concrete and 25 percent of its steel? What is the global impact of 300 million rural Chinese walking off their farms and heading to the cities in the greatest migration in human history? Why do nearly all of the world's biggest companies now have large-scale operations in China? What does the corporate march into China mean for workers left behind in America, Europe, and the rest of the world? Meanwhile, what makes China's emerging corporations so dangerously competitive? What could happen when China will be able to manufacture nearly everything - computers, cars, jumbo jets, and pharmaceuticals - that the United States and Europe can, at perhaps half the cost? How do these developments reach around the world and straight into the lives of all Americans? These are ground-shaking questions, and China, Inc. provides answers.Veteran journalist and former commodities trader Ted C. Fishman paints a vivid picture of the megatrends radiating out of China. Fishman's account begins with the burgeoning output of China's vast low-cost factories and the swelling appetite of its 1.3 billion consumers, both of which are being driven by historically unprecedented infusions of foreign capital and technological know-how. Traveling through China's frenetic landscape of growth, Fishman visits the factories, markets, streets, stores, towns, and cities where the story of Chinese capitalism is being lived by one-fifth of all humanity. Fishman also draws on interviews with Chinese, American, and European workers, managers, and executives to show how China will force all of us to make big changes in how we think about ourselves as consumers, workers, citizens, and even as parents. The result is a richly engaging work of penetrating, up-to-the-minute reportage and brilliant analysis that will forever change how readers think about America's future. Along with Thomas Friedman's "The World Is Flat", this is one of the most important books I've read to date. I will recommend both books to anyone I meet. China is well on its way to becoming the next world superpower, and this book details many ways it is doing so. There will be a day very soon when almost all manufacturing of anything from concrete, to toys, to cars, to software/hardware will only be done in China. At this point, they can essentially do anything they want in the global market. It never ceases to astound me how people are so willing to look the other way when China continues pirating anything it wants, both legally, as well as illegally. Something needs to be done to slow this unfortunate trend down, and put all players in the global economy on a level playing field, or soon, China will become "Big Brother" to every country on the planet. My only regret is that the information in this book is already 5 years out of date! Frightening read! I enjoyed this book. I am in an industry that is slowly moving to Asia for the cheaper labor. I understand the changes going on in China much better now, especially how there is an unlimited supply of people willing to take jobs for low wages. I had read the reviews and believed this book would give me an edge. It was informative, but it drags and gets into too many details. I get the point and it could have been said in half as many words. This is very interesting and timely. I visited China in 1997 for 3.5 weeks with a China family and saw a country just starting to wake up. Well they woke up and are rapidly making a large impact on the rest of the world. It is time that the rest of us wake up and understand this economical power. There is hardly a city, a neighborhood, a home in the civilized world that is not effected by what is happening in China. Along with "The World is Flat," this is the best work I've found at telling us why. In just 1 example: China says its population is 1.2-billion. The CIA says China undercounts its population by 300 million! If true, that UNDERCOUNT is equal to the TOTAL population of the United States! The emergence of China as a world leader in manufacturing WILL be followed by the emergence of China as a world leader in CONSUMPTION, (both good & bad news). If you don't think that effects you...check the price of gas the next time you fill up (China is using much more oil now). Oh, & if you're planning to pour a few yards of concrete for a patio, you might place your order early, China is now using more than 40% of the world's production of concrete. Read this well written book and then if you have not read "The World is Flat," pick it up and take the time to read it too.